But becoming simply literate is not enough. For academic and professional success, you need to learn how to read well. 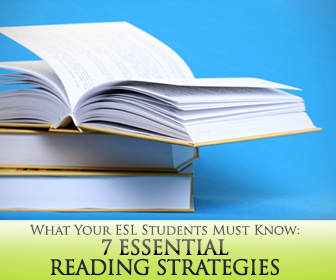 ESL students, in particular, need to develop the reading skills that will enable them to not only comprehend texts in English, but also obtain what they need to deliver a response, whether this is a written/oral reply or an action they must take. These are the essential reading strategies that you should be teaching your students — at any level. Previewing is absolutely essential for students to get a sense of what the text is about. Elements that are usually helpful for previewing are newspaper headlines or titles; images or photos; and signal words or format. For example, if the article has words like first, second, third, etc… at the beginning of each paragraph or is a numbered list, students will get the sense that the text lists steps or is a roundup article. Reading Exercise: Choose a newspaper article with a great headline. Before reading the article, ask students what they think the article will be about, based on the headline. It is always helpful for students to learn to place the text within a context. Is the news article centered on something that happens everywhere in the world, or just in one specific location? Is this something that affects you, the reader, or other people in the world? Does the main character in the story go through something you can relate to, or something you have no experience in? These are great questions for students to think about as they read. Reading Exercise: Before reading this text about Education in Britain, discuss the educational system in the country your students are currently in: How many years of grade school are there? How many years of high school? Students read about what it’s like to go to school in Britain and compare it to their country. Some students, especially those who are visual learners, need to “see” the information. Can you see the main character in your mind’s eye based on the description? Can you picture the contaminated river as described in the news article? Visualizing also involves organizing the information in a visual way, usually through the use of a mind map or other graphic organizer. What questions come to mind when you preview an article? How will the main character solve this problem? Students need to come up with questions they would like answered in the text and pay attention to how they are answered. Reading Exercise: Read a news article or a piece like this one about the Boston Marathon. After reading the title, ask students to come up with three questions they expect the article will answer and then read to see if they find the answers. After the reading, students should be able to summarize what they’ve read. This may be a short oral summary or a full paragraph. Summarizing includes a very important skill: getting the gist. What was the main point in the story? Summarizing is not retelling everything that happened as it happened, and students need to not only tell the difference, but also learn to give back information in a clear concise manner. Reading Exercise: Ask the class to read the story of Helen of Troy. Then, ask them to summarize in just one sentence or two what caused the Troyan War. Skimming and scanning are usually considered speed-reading skills because they are not used for intensive reading. They are essential skills nonetheless, and students need to know that sometimes intensive reading is not necessary. Skimming a text involves running your eyes over it quickly to get the main idea. It also allows you to identify which parts of a long text you might want to read more closely. This skill is particularly useful, for example, for Business English students who have to read long reports that are several pages long. By skimming the report, they can still follow the gist and stop when they find something of particular interest to them. Reading Exercise: Hand out different magazines or newspapers in English, and tell the class they have five minutes to skim one. After they’re done skimming, ask them what stories they remember reading. Scanning, on the other hand, allows you to quickly search a text for a particular piece of information. Scanning is ideal when students need to find a phone number in a directory, the date of a historical event or the time their train is leaving. Reading Exercise: Show the class this PowerPoint slide about Jobs. Divide the class into groups and give each group 2-3 questions to answer. You can use the same questions that appear on the right but in a different order. Each group must scan the text to find the information they need to answer the questions. We must also teach skills and strategies that will help our students succeed in whatever they choose to do.